Mango Lemonade with mango puree, freshly-squeezed lemon juice, and simple syrup. 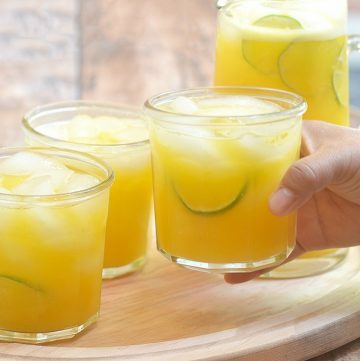 Perfectly sweet and tart, it’s a refreshing drink you’ll want all year long. 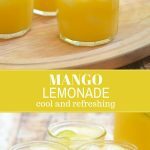 Mango lemonade is an easy way to deliciously spruce up the ubiquitous lemonade. With the simple addition of fresh mango puree, you get to savor tropical island flavors without leaving your kitchen! 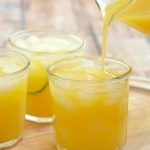 If you like juicy mangoes, you’ll love how their sweet taste combine with tangy lemonade to create this all-natural refreshment that’s sure to be everyone’s favorite. 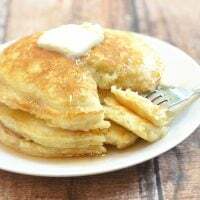 I like to use simple syrup but feel free to swap with honey or agave nectar if you prefer a healthier sweetener. For intense mango flavor and natural sweetness, choose ripe mangoes. To extract the most juice, make sure lemons are at room temperature. 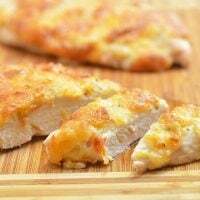 Better yet, warm them in the microwave on HIGH for about 20 seconds or allow to sit in hot water for about 30 seconds. After warming, roll lemons on a solid surface until their flesh soften. Infuse the simple syrup with your favorite herb for another layer of flavor. 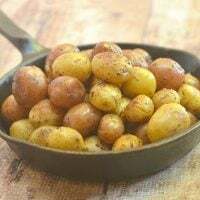 Just add a few sprigs of basil, mint or thyme to the syrup after removing from the heat and allow the herbs to steep while the syrup cools. Remove the herbs before using the simple syrup. If you don’t have access to fresh mangoes, substitute canned mango puree in equal amount. I like to make my lemonade pretty tart and sweet as the added ice naturally dilutes the mixture. Feel free to add more water to suit taste. To easily kick up the drink for grown-up fun, add a splash or two of vodka. 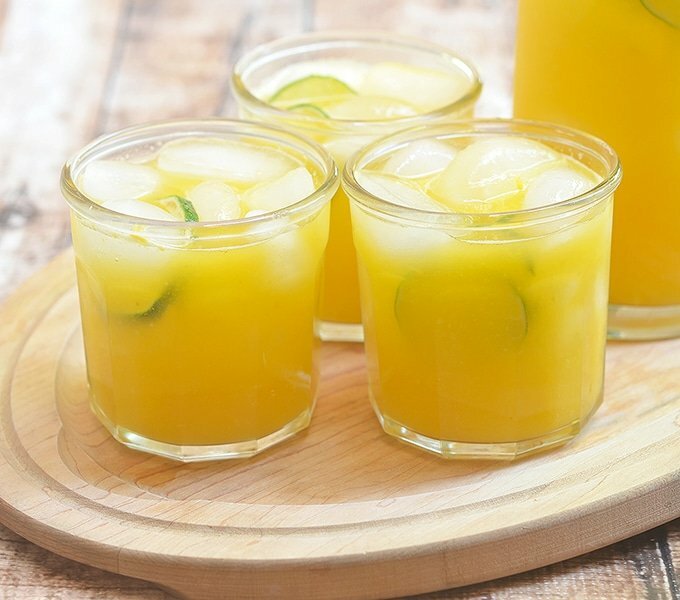 Take advantage of fruit season and give this lemonade mango recipe a try. 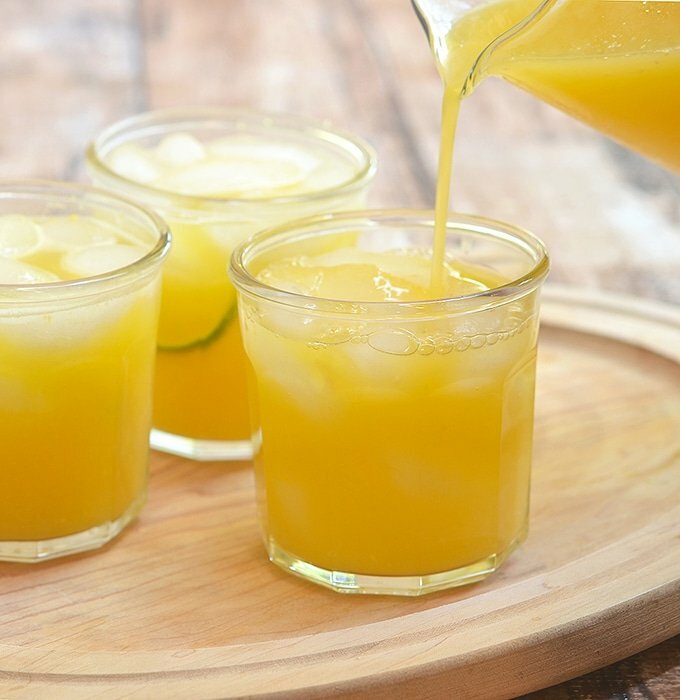 Perfectly sweet and tart, it’s a refreshing drink you’ll want all year long! Make sure to check out my strawberry limeade, watermelon lemonade and Brazilian lemonade for more delicious ways to hydrate. Mango Lemonade with mango puree and freshly-squeezed lemon juice. 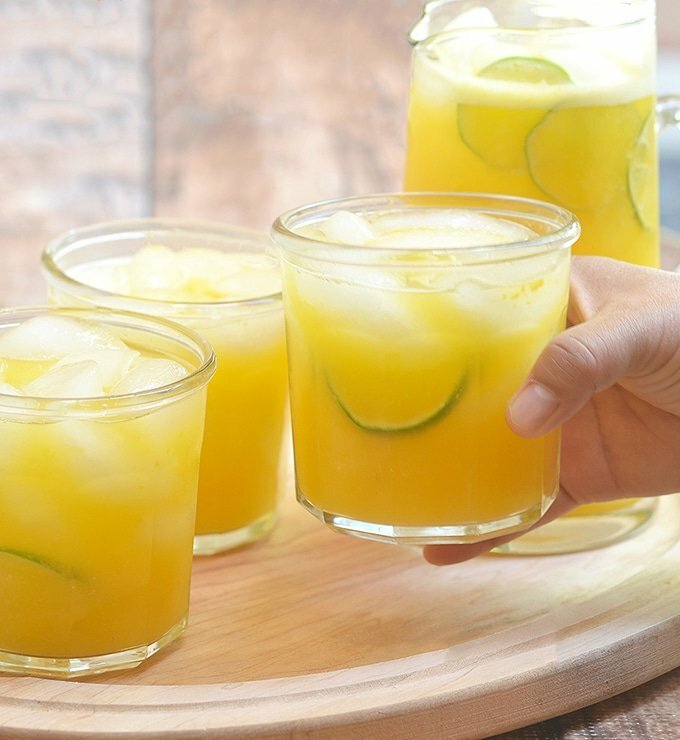 Perfectly sweet and tart, it's a refreshing drink you'll want all year long. In a sauce pot, combine sugar and 1 cup water. Over medium heat, bring to a simmer, stirring regularly, until sugar is dissolved and syrup is clear and no longer cloudy. Remove the simple syrup from heat and allow to cool completely. Slice mangoes and scoop flesh, discarding pit and skin. In a blender or food processor, process mangoes until smooth. 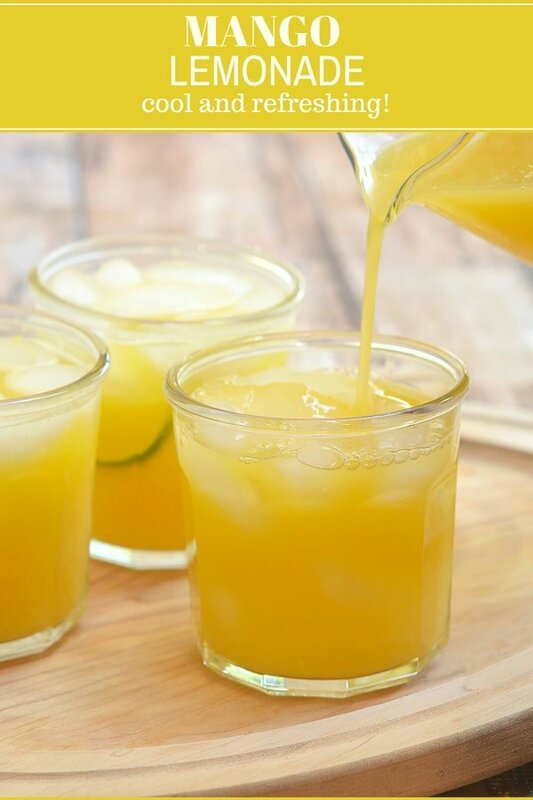 In a pitcher, combine mango pulp, lemon juice, simple syrup and the 2 cups chilled water. Stir well. To serve, pour into glasses over ice. Garnish with sliced limes or lemons and fresh mint sprigs, if desired. Great! 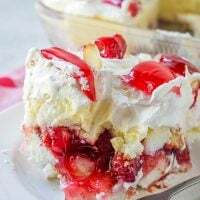 I will make one for my family!